Welcome to Pennsylvania, the Keystone state. On this page I have placed several pictures of murals I created in Reading, PA. I loved Pennsylvania, but negative 4 degrees was too COLD for me. 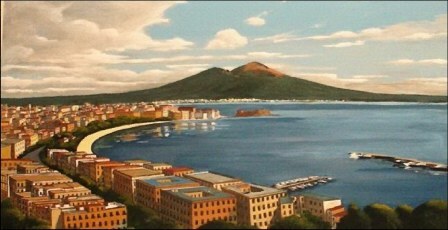 Luckily, I was painting coastal vistas of Naples, Italy and the ambiance got warmer. Mural of San Miguele Di Allende, Mexico. Fiesta Mexicana, Reading Pennsylvania. 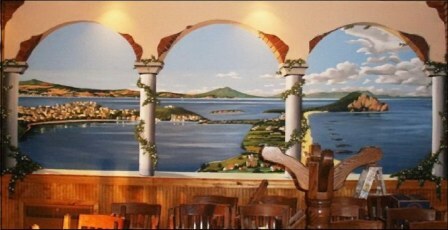 The mural includes the panoramic scene of San Miguele Di Allende, Mexico, as seen through stone arches. 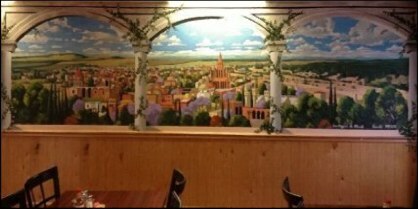 Jesse Demolli to paint murals of Italy in Redding, PA.
Murals of Naples and Bacoli grace the walls of Esposito's Restaurant in Redding, Pennsylvania. Demolli Art Studio paints elaborate wall murals in Pennsylvania. 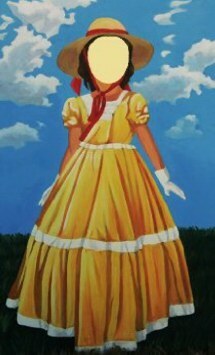 We can design a mural for any decor, suit your living room, bath or business. 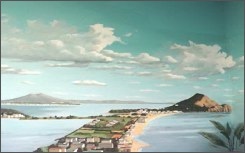 Artist Jesse Demolli specializes in residential and commercial murals. Demolli Fine Art Studio works with interior designers, business owners, museums, contractors, event managers, theatres, homeowners and architects.